Now, together with Chatfuel and TechCrunch teams, Bitext has developed a new and improved version of this bot. We integrated our NLP middleware into the existing bot architecture to make it benefit from our rewriting service for chatbots. The result is an enhanced version that handles conversational interaction, improved natural language understanding, including double intents, and unique features like negation understanding. So how does this rewriting service work? Sentence rewriting normalizes every variation of a sentence to a common meaning, making chatbots understand users no matter how they express their requests. As any of our NLP middleware services for bots, it can be used with every major bot training platform like Dialogflow, LUIS, Lex, Watson, Wit.ai and others. Also, it can be adapted to any chat interface such as Facebook Messenger or Slack, and integrated with every type of chatbot framework and search engine. What exactly are the implemented improvements? Thanks to Bitext's technology, TechCrunch bot now understands more queries in natural language, like "I'd like to read some news" or "What do you have about Tesla?". Humans tend to express themselves in creative ways and bots need to be prepared for that. Also, it is now capable of handling conversational double intent. That is, users can ask for news that share multiple characteristics. For example, you could type “I'm interested in chatbots and AI” to find news about both matters. Finally, an important feature to cover was conversational negation, which allows to exclude certain elements from the search. Examples of natural negation would be "Snapchat news apart from the mention ones" or "I want news on Microsoft but not AI". 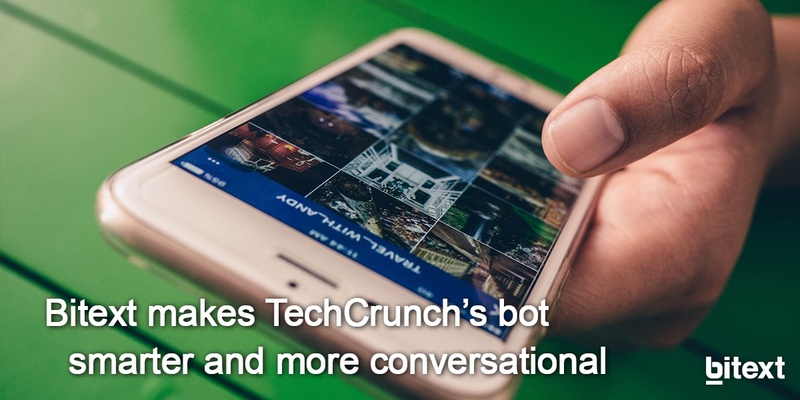 Learn more examples and how we were able to deploy TechCrunch's bot upgrade. Bitext NLP middleware for bot training is the most flexible solution in the market to enhance the communication between humans and machines. As you can see, by implementing our technology your bot will be able to understand users’ requests without forcing them to speak like robots. You can learn more by downloading the use case below or try the service now registering for free in our platform.